Faye Tozer to STEP into a west end musical! It would be a tragedy to miss her! 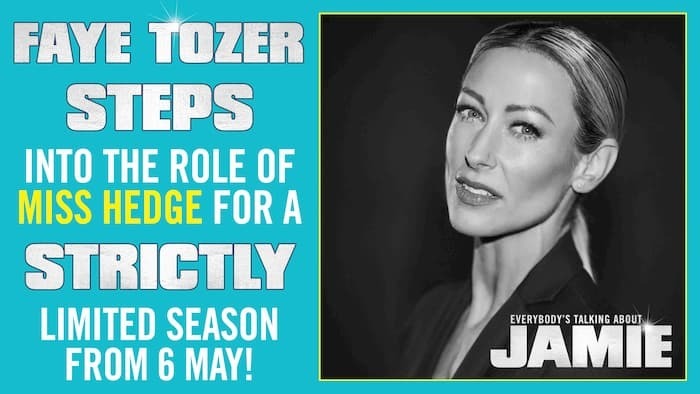 Faye Tozer will join the West End cast of 'Everybody's Talking About Jamie'. Tozer, a former individual from the band Steps and 2018 finalist in Strictly Come Dancing, will assume the role of Miss Hedge from 6 May until 3 August. The hit musical, which first opened in November 2017 and is presently in its second year in the West End, will presently be booking until Saturday 25 January 2020, with current star Layton Williams affirmed to play lead character Jamie New until that date. The show originally opened at Sheffield's Crucible Theater in 2017 and has music from Dan Gillespie Sells and book and lyrics from Tom MacRae. It won three WhatsOnStage Awards in February 2018, with the piece claiming a further honour for Best Cast Recording in March 2019. It is directed by Jonathan Butterell with design by Anna Fleischle, choreography by Kate Prince, lighting design by Lucy Carter, sound design by Paul Groothuis and musical direction by Theo Jamieson. Miss Hedge is Jamie New's teacher, so only a minor role in this performance, it has been played by many legendary icons in celebrity history. Below is a list of people who have played the roles, up to and including Faye Tozer. WHAT DO YOU THINK OF THIS? LET US KNOW IN THE COMMENT SECTION BELOW!